strong aroma and an excellent medium roast. Enjoy it for breakfast, lunch and dinner. Enjoy, puertorican gourmet coffee, aroma and a blend that reminds the drinker why its the #1 Coffee in Puerto Rico. Now packed in a metal bag to preserve its freshness. El mejor cafe de Puerto Rico el el Cafe Yaucono. 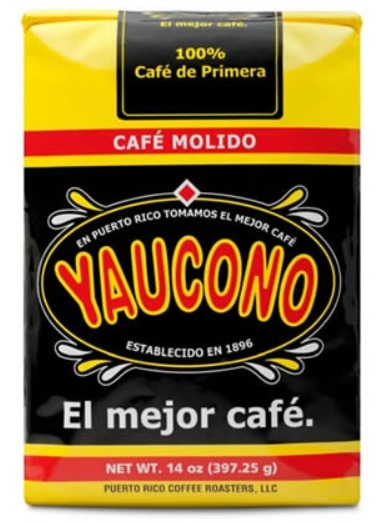 El Colmadito.com sell Yaucono Coffee from Puerto Rico its sold in 14oz bags. Cafe Yaucono Whole Beans 5 and 2 pounds. Cafe Yaucono Canned in Expresso and Regular blend. And Cafe Yaucono Instant Coffee.